The first thing you see when you pick up a record (or download a track, stream a song, take your pick), is bound to be the title. That’s what informs you that you’ve chosen the tune you intended to get after all and so it stands to reason that a title is a pretty important facet of the creative process. I know, you can’t judge a book by its cover and all that, but when it comes to standing out and making an impression that will get a curious but unconvinced potential listener to at least give a record a chance, coming up with a clever title seems like a vastly underused method in music marketing. A title that holds some intrigue, hints at things that don’t appear obvious, or just one that shows a bit more creativity than merely choosing the words contained in the vocal hook, are easy ways to give the potential record buyer the sense that what they’re getting had some effort put into it and might be worth checking out. For the second time in three releases Lonnie Lyons seems to have fully grasped the importance of piquing our interest before the needle even hits the groove. Of course a good title, even a great one, is no assurance that the content will live up to the words on the marquee and we have to admit that most legendary songs of all genres have rather mundane titles. I suppose you can also go too far in the other direction too, coming up with something so convoluted that its intent to dazzle you with cleverness is far too obvious to be tolerated. But Lyons has been able to walk a fine line thus far in that regard, first with Flychick Bounce from back in May, a title which seems casually hip and slightly mysterious while the song itself proved just as rewarding for what he and his group of musical mad men laid down. Following an all-too routine sounding title in Neat And Sweet, his June instrumental follow-up which was nonetheless pretty solid musically, he’s back, stretching his vocal cords once again on a song that twists two meanings together in its own stellar title. 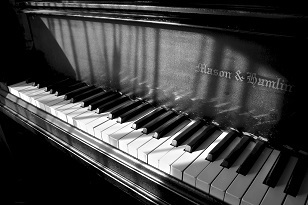 “In The Groove” of course is a term that applies directly to music, as it references a band locking into a tight rhythmic playing, something rock artists certainly have found to be almost a prerequisite for the form, particularly in comparison to the more free-style melodic forms of much of jazz. So on one hand the title is alluding to that terminology and with the addition of the word “Down” it suggests that to listen to this record means you’ll indeed get down IN that groove soon enough. But then by altering the last word by a single letter, from “groove” to “groovy”, it takes on a whole ‘nuther inference. Now the peak usage of groovy (at least in a non-ironic way) was the period of the late 1960’s through the mid-1970’s…let’s call them The Brady Bunch Years. But the term began to gain a little more traction right around… you guessed it, 1949/50. Not a LOT mind you, but before the 1940’s it had been virtually completely obscure before jazz artists began using it as a rather whimsical term throughout that decade. By the end of the Forties it was at least recognizable – and understandable – to all but the total squares (another jazz term, in case you’re wondering). I dunno, maybe I’m making too much of this, I probably am considering that 1949 has seen songs with such titles as Candy Kisses and A – You’re Adorable become huge hits. But as long as music is a creative artistic endeavor then it stands to reason that creative titles should be a little more common than they are, which is why Down In The Groovy jumps out in the roll call of rock releases for the summer of 1949. On the surface Lonnie Lyons was an artist of convenience. His primary job was that of a session pianist for the studio band for the newly formed Freedom Records who probably only got a chance to record under his own name because the fledgling company didn’t yet have enough artists to support a steady release schedule. Since they had these guys already in the studio on a regular basis it made perfect sense to give them a few singles under their own name. It wouldn’t require signing them to contracts – as if there were such things at small labels half the time – nor would it cost much to keep the tapes running at the end of someone else’s session while the band worked something up. Nobody – artists or label alike – had any real expectations for these sides commercially I’m sure, but these releases weren’t about scoring hits as much as they were about building a company’s reputation. If nothing else it’d give Freedom Records a ready supply of releases, thus more “product” to push with distributors who’d take that as a sign they were a legitimate label, not some fly-by-night amateurs who couldn’t be relied on to stay in business. The other benefit to putting out these records was it’d keep the band members reasonably happy. Surely they weren’t being paid much for their studio work and while it’s doubtful they got a dime more for their own material it wasn’t money that was the most valuable currency here, it was hope. The far-fetched but still tantalizing hope that one of these sides might catch on with someone and vault them into the realm of being stars in their own right. Even though most legitimate stars in rock during this period would wind up no better off financially when their career wound down a few years down the road, they’d get to live something resembling the high life while the hits kept coming. Big shots with their names painted on the side of a station wagon as they toured the south, getting applause on the bandstand each night while they played one dingy club after another and getting drunk and getting laid in between. So Lonnie Lyons, by virtue of his ability to sing with halfway decent skill in addition to his piano playing, got singled out as the one with the most potential and had a string of releases under his own name. Not surprisingly none of them were hits. Less surprising for those who’d been so impressed by the band’s efforts behind Goree Carter, L. C. Williams and others, was the records were just as good as most hits. Down In The Groovy is no exception. There’s something charmingly rudimentary about this song, and for that matter these musicians, which winds up being their strong suit rather than a detriment in their work. They specialize in a raw roadhouse sound, a playing style much farther removed from the more precise jazz backgrounds of many early rock stars and because of that their music takes on an edgy impatience that manages to come across on record. It’s almost as if you snuck a microphone into the hole in the wall bar or tobacco barn they were performing in to capture them in their element. All that’s missing from that scenario are the rowdy contributions from the audience. Lyons rolling piano boogie kicks things off and is a sound so universally familiar for this realm that you’d be excused for thinking you’ve heard it before. It’s not flashy by any means but it remains a bedrock of the genre because it’s so elemental to the mood rock always tries to convey. A simple unrelenting groove for listeners to fall effortlessly into. This is accented by Goree Carter’s stinging electric guitar, itself playing a different boogie progression to off-set Lyons. He doesn’t take the lead during this stretch but his presence is vital in giving the song more body and creates almost an ominous feel to Down In The Groovy. The biggest supporting role however belongs to the horns who jump in behind Lyons once he starts to sing, first playing another droning riff that’s only adding color before they move to the forefront after Lyons’s initial – and very strong – piano solo to deliver one of their own. It’s not a wild sax solo as we’ve come to expect from so many rock records to date, but rather one designed to keep the ambiance intact. More mesmerizing than menacing, they wrap themselves around your consciousness with a slithering determination until you look down and realize you can’t get free. When Carter gets his own moment in the spotlight towards the end even he, for all the explosiveness he possesses in his guitar, manages to keep it in check which in this case is hardly a bad thing. He unwinds the fabric of the song more than overwhelms it, providing a different sonic texture without disturbing the overall feel. All of this sounds very organic by nature. It envelops you in a way, pulling you in, if not pulling you under, and yet you don’t fight against it because of how enchanting they make it seem. Lyons deserves added credit for this feat not just because he gets to flex his muscles on some extended piano solos himself, all of which show him to be every bit the equal of his cohorts on his own instrument, but because he proves once more than his role as a vocalist was not just a matter of convenience after all. We’ve recounted plenty of times the vocal similarities many artists had with Amos Milburn and have debated how intentional that may have been. Milburn after all was arguably the biggest rock star of the 1940’s and so it was inevitable that somebody try to mimic his approach in an effort to appeal to the same audience. Yet the ones who’ve done so with the most aesthetic success have all been drawn from the same environs as Milburn emerged from. Little Willie Littlefield was another Houston-based pianist whose voice bore an uncanny resemblance to Milburn’s and there’s no consensus on whether that was due to the shallow commercial goals of record companies hoping to somehow dupe listeners into thinking it might be Amos himself, or if it was Littlefield who simply hadn’t found his own voice yet and was still imitating a slightly older local boy made good. Then again it might simply be a shared trait owing more to the same regional influence than a concerted effort on Willie’s part to sound like someone else. Now we hear it with Lyons too, another kid who’d come from the exact same Houston scene as both Milburn and Littlefield and so the idea that it was intentional on his part as well starts to seem a little shakier. But that being said, whether done knowingly or innocently, on Down In The Groovy Lyons unquestionably sounds a LOT like Amos Milburn, drawing out his vocals with laconic ease. There’s a soothsayer quality that all three of the aforementioned singers possess which gives you the sense of being seduced by their voices. Even when Lyons steps up the pace and emphasizes some of the declarations with a bit more urgency he still comes across as if he’s out to hypnotize you until you can’t possibly resist what he has to say. But when when what he’s putting across sounds this good why would you resist? Lyons performance, as with the others, is merely part of the larger atmosphere. The words he sings aren’t very deep, they’re just setting the scene of a place where every listener of this type of music would feel most at home. Drinks flowing, music playing, girls dancing, men boasting, everybody shedding their cares and handing over their money, whether to a doorman, a bartender or to each other following whatever illicit games in the corner you’ve come to gamble away your paycheck on. It’s a world unto itself, a vibrant world for sure, yet not one without more than its fair share of problems. Those partaking in all of this – and I’m including the musicians themselves – aren’t ever going to get ahead in life. They know this perfectly well, the circumstances of their existence all but guarantee this, but they’re not internally resigned to it by any means. These long nights at some party on the edge of town represent their best chance, maybe their only chance, to free themselves of the shackles of everyday life in all its stifling oppression, even if only for a few hours. But rather than focus on the negatives in their daily lives, the backbreaking work for little pay, the lifetime of indignities forced upon them, the avenues of opportunities being blocked off from them, they’re choosing instead to build up their own small corner of the world into something that can provide them with a little relief, a lot of joy and with enough pride in their communal activities and in those they share them with to face another day tomorrow. It may only be music and it may only last a short time before the next day’s dawn rises to greet them, but WHILE it lasts everyone within earshot relishes their chance to get Down In The Groovy and forget about the outside forces that keeps them from the life they dream about while at the same time celebrating a life that refuses to let those dreams themselves be stifled completely. 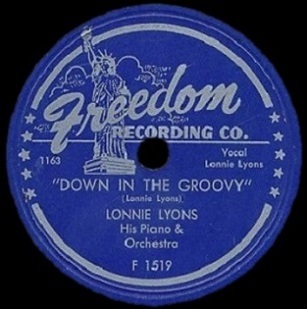 Leave a reply on "Lonnie Lyons: “Down In The Groovy”"